2014 was a year of new beginnings, with new engines, new champions, new drivers and new challenges. Formula One was reinvented to give the sport purpose, to keep it relevant to the changing world. We ended up with distasteful looking cars, but they certainly delivered out on track. The revamped regulations and the modern machinery provided drivers and teams with a huge challenge to surmount, and it was intensely entertaining to watch it all unfold. Granted, we did wind up with one dominant team and a smaller than ideal battle for the championship, but each race held its own fascinating fight for the finish - some of the action on track was incredible. Even the Bahrain Grand Prix was an exciting race to behold, regardless of what time of day it took place, and that was down to the new style of motorsport Formula One is moving into. The representative bodies failed to demonstrate the fact the sport took a huge step forward in terms of sustainability, becoming environmentally conscious. The cost row, a valid one that continues to rumble, overshadowed the power unit overhaul - super fast cars with manageable fuel loads and superb energy recovery systems tucked away on board. There were times when conservation was key during a race, but that’s long since been the case. It didn’t stop the all out moments where a driver wanted nothing but to chase after the race leader. We often knew what make of car would be taking home the constructor’s trophy, but the order of the podium, and that third place position, was still a delicious mystery. It wasn’t all shiny and rosy, of course. Two teams failed to see out the entire season and look unlikely to reappear any time soon. Bernie Ecclestone managed to drag the sport through the mud, making F1 a laughing stock with his unique take on the legal process, and of course Jules Bianchi’s horrific accident and subsequent lengthy recovery still weighs heavy on everyone’s minds. Away from the paddock, Sidepodcast continued throughout 2014. Real life intervened on occasion, meaning we did less podcasting than we might have hoped for. There was live coverage for each and every race weekend throughout the year, great fun and invaluable as a resource. An Aside with Joe continued to be at its headline-grabbing best, with Joe Saward pulling no punches when it comes to analysing the sport. F1Minute summarised the news into respectable bite-size chunks throughout the year, and Christine’s Rankings crowned Daniel Ricciardo as its fifth annual champion. Also, a large group of Sidepodcast friends met up in Canada to witness Ricciardo’s debut victory, and a similar expedition is planned for Australia next year. 2015 should bring even more good things from Sidepodcast. There’s still an element of real life to be dealt with, but we’ve got a huge amount of motivation and focus about where we’re going. The building blocks are all in place to increase quality, and perhaps quantity, bring back old favourites, while making the content the best it can possibly be. F1 also will be ramping up again, testing and launches get underway soon, revealing the new class of 2015 and what they will be driving. New partnerships will be revealed and we’ll soon see how they all stack up against each other once the cars get going in Melbourne. All that remains to say is a huge thank you to everyone who has taken time out to listen and connect with Sidepodcast this year. You continue to be amazing and inspirational, and we love hearing from you every step of the way. 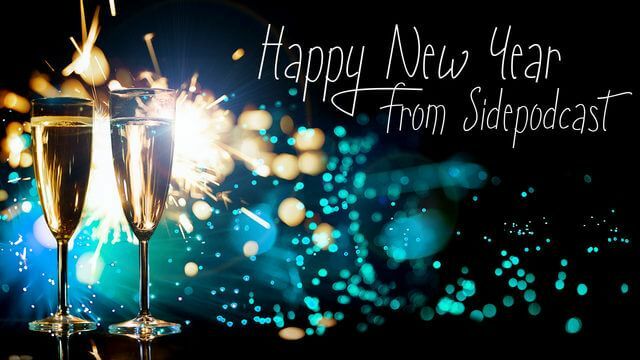 It’s time to raise a glass and toast to you, to Sidepodcast, to F1 in 2015 and to a very Happy New Year.